The ReCalibratable Thermometer is perfect for those than need accuracy and requires thermometer calibration. The probe is attached to a one meter cable to provide flexibility and safety to the operator when monitoring extreme temperatures. 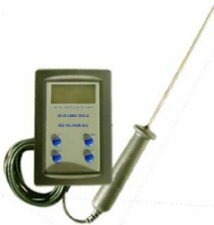 This ReCalibratable Thermometer is able to provide the operator with several user options, for instance, it can be used as a hand held thermometer, or attach it to the wall with screws or a metal surface with the magnet on its back. To recalibrate use the screw situated at the back and follow instructions provided. When I first switched on it worked then the display sent off. I tried changing the battery it no difference. I left it and was about to return it when it started reading again. It still reads but I don't have a lot of confidence in it. I bought it as a room thermometer to read in awkward places. I find as it approaches the temperature it takes a long time to reach the final temperature so not certain when this ia achieved. wanted. Delivery (over the Christmas period was excellent. Oh and the product was exactly as described. so far so good, re-calibratable and 0.5 degree accuracy, just what i needed, arrived in excellent condition, good timing and I am sure they are doing there job!